Looks like you are frustrated from your PC because of slow start ups. you were in a hurry of doing some task you turned on your PC and now its taking ages to start up. and when it started it is showing you numerous apps which you don't want at current time. So here is this little guide which will show you steps in troubleshooting your slow start up problems. 1) First of all you need to download third party freewares called CCleaner and Defraggler , you must be thinking what is a freeware now for you in short and simple its a software which is free of charge. 2) Install them as it is not too much to ask. isn't it? installed? 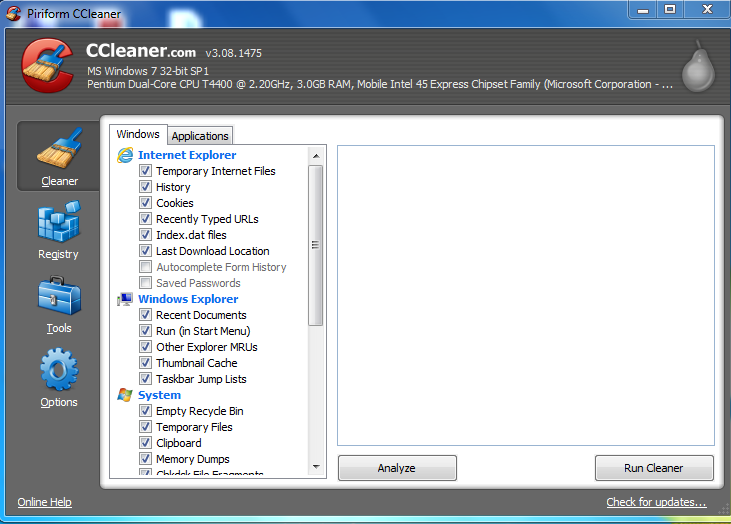 ok now you need to run the CCleaner below you can see the start screen of the cleaner. Click on analyze button and then click on 'run cleaner' that will remove your temporary files which were downloaded from internet while you were surfing the net don't worry they are useless for you and the software, documents you downloaded are safe in the directory. 3) Next click on registry click on 'scan for issues' button it will collect all the unused and missing registry value which is no more used by your operating system. now click on 'fix selected issues' just after that a dialog box will appear saying whether you want to make a back up of the registry or not well if you want to then you can make one, it might be helpful if your PC behaves abnormally. and you can restore the registry later on with this back up file. i never make it because i don't need to restore. now click on 'fix selected issues' and you are done with the registry. With uninstall you can uninstall those programs which are no longer used by you, or games which you don't play anymore. i won't explain this in detail. In the startup section you will find programs which are automatically loaded after a computer starts. that means when you cross over the welcome screen this is the devil which slows down most of the process. here disable those programs which you think are not needed at the startup this may include( IDMan, swg, Yahoo! Pager, RtHDVCpl, Adobe Reader Speed Launcher, torrent, gtalk etc..) depending the no. of programs you have installed. and don't worry you can independently turn on these applications later on. System restore manages various system restore which your operating system has made so that if you fall into a trouble you can restore to a previous state. that is enough for you to know at this time. Drive wiper this function may or may not be present. this is again not important for you. but please don't play with that. Please note the startup thing could be done alternatively by typing this simple command in the run 'msconfig' without quotes. then go to startup tab and disable programs . after clicking ok it will ask you for a restart and then its up to you. 6) The user interface is quite simple, you have to just click on the drive and then click on the 'Analyse ' button and then it will tell you the fragmentation percentage. 7) Now here is a tip if you are running a good performance PC i.e running on a good configuration then the need for defrag is when the percentage reaches more than 10% otherwise on a low specification PC you should defrag when it reaches to 5-6% depending on your need. Well if are not a heavy tasker( not moving your data every now and then) then it is required to defrag it once in 3 months otherwise. defrag comes in handy every time! 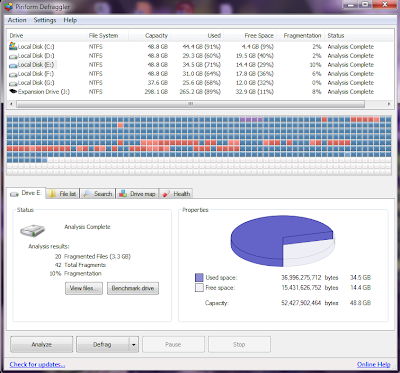 If you want to know whats happening while defragging your drives then let me tell you in short. It rearranges your data on the drive in a more continuous manner than the discrete way. as you can see in the below picture my Drive F has free blocks in the white spaces between the blue ones. so i need to defrag it to make it more continuous and hence it will improve the performance of the drive F.
8) So in the defrag button you will find two options 'Quick Defrag' and 'Defrag' i would recommend you choose the Defrag option because it will although take much of the time but the Data will be arranged properly. 9) Yeah one more thing clean your hardware in the CPU as dust on the board and other peripherals might block the passage of the charge and might slow down the process too. 10) Always install a good antivirus and update it regularly as worms might slow down the process too. So here we reach at the end of the guide, hope you didn't found it difficult to understand. and if still the problem persists message me or just post in the comment section.